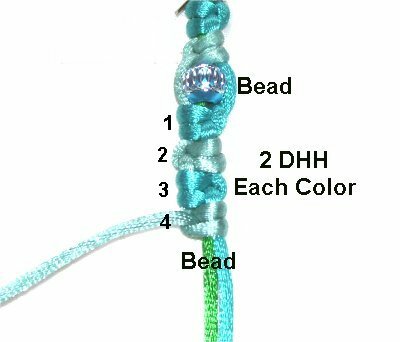 Description: The Beaded Hitch Bracelet features the Double Half Hitch, arranged vertically, with the knots arranged in alternate directions. 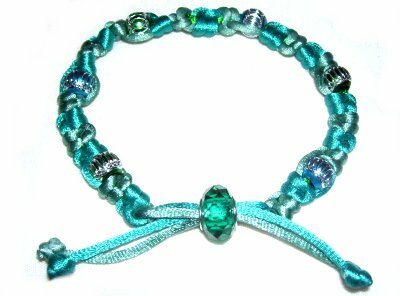 This Micro-Macrame bracelet has a sliding bead closure. This Macrame project is easy to make, and requires very little time and effort. So it's a great beginner's project. In the example, I used three colors for instruction purposes. All you need to make this bracelet design is two colors. In the example shown, I used Satin cord. Should you decide to use this material, make sure you do not pass the pins through it, since it's delicate. Instead, lean the pins over the cord, or use tape. Step 1: Cut two cords, each at least 72 inches long (one of each color). Cut 1 holding cord, 12 - 18 inches long. 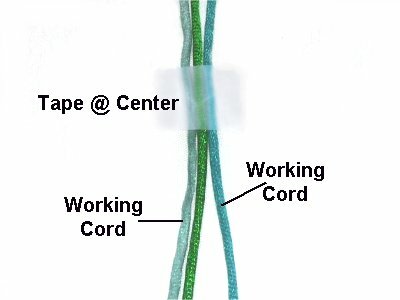 Prepare the ends of the holding cord with glue. The two working cords can be prepared any way you prefer. Arrange the cords vertically, centering them by matching the ends. The holding cord should rest between the two working cords. Place a piece of tape across the cords to mark the center. Step 2: Use the working cord on the right to make a Half Hitch in a clockwise direction. Tie it around both of the other cords. 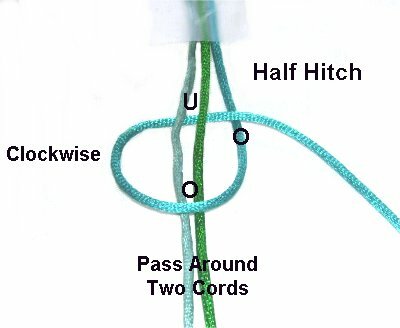 A Half Hitch is tied by passing over - under the cords holding the knot. As you pull the end to the side, pass it over the working cord. Step 3: Tighten the first knot so it rests against the tape at the center. 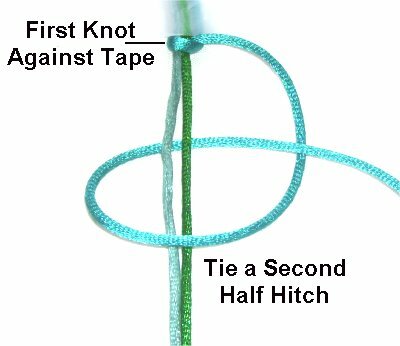 Then tie another Half Hitch with the same cord. 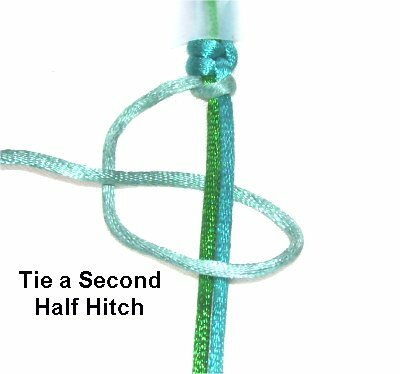 Both knots together are considered one Double Half Hitch (DHH). Step 4: Switch to the left working cord. 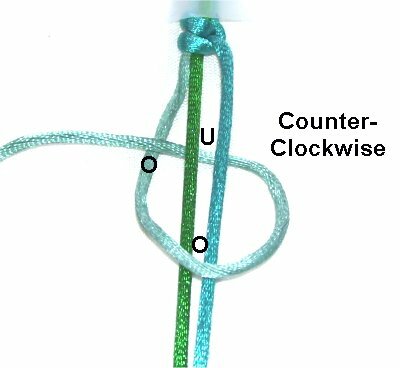 Tie the next Half Hitch rotating counter-clockwise. Make sure it goes around the right working cord, along with the holding cord. Step 5: To make this a Double Half Hitch, tie another one using the same cord. 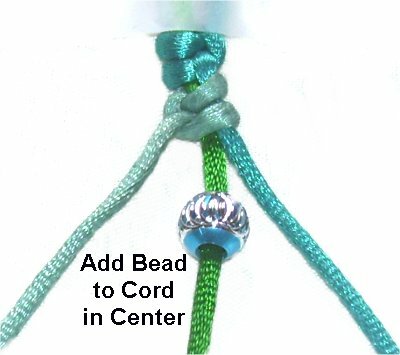 Using a cord threader is recommended as you add the beads for your Beaded Hitch Bracelet. 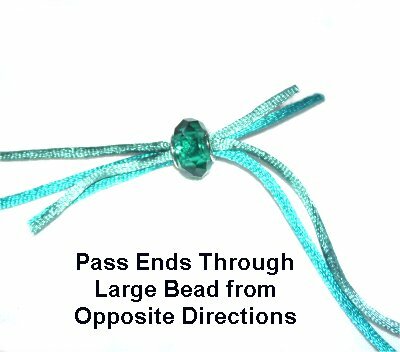 Fold a wire in half and direct it through the hole in the bead. Place the holding cord through the wire near the folded area. 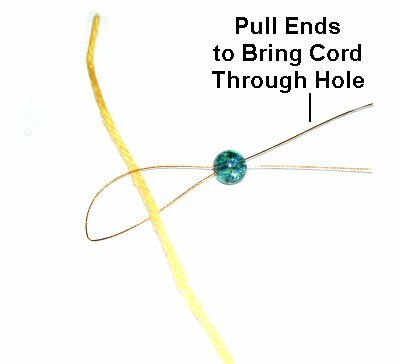 Pull on the ends, which will bring the cord through the bead. Step 6: Add one bead to the holding cord. Design Tip: When you tie the next DHH, make sure the working cords fit snugly around the bead. Step 7: Tie a DHH with each color, and then repeat, for a total of 4 DHH. Add another bead, and then repeat this process. Continue on in the same manner. As you progress, keep the knots as flat as possible. Stop when the Beaded Hitch Bracelet is HALF the size you want. So for an 8-inch bracelet, stop at 4 inches. Step 8: Before you tighten the last DHH in the first half of the bracelet, apply glue under it, so the knot will be attached to the holding cord. Wait until it dries, then cut off the holding cord. 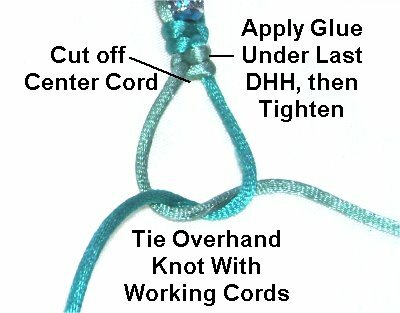 Tie an Overhand knot with the two working cords. Apply glue as you tighten that knot, too. Step 9: Turn the bracelet around, and go back to the center. 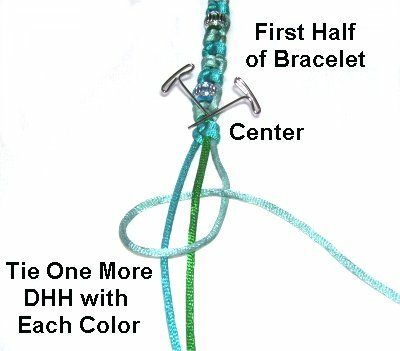 To keep the beads following the same pattern, tie one DHH with each color, and then add a bead. You should start with the right working cord. Step 10: To make the clasp, pass the two cords from the left half of the bracelet through the bead, from left to right. Pass the cords from the right half from right to left. 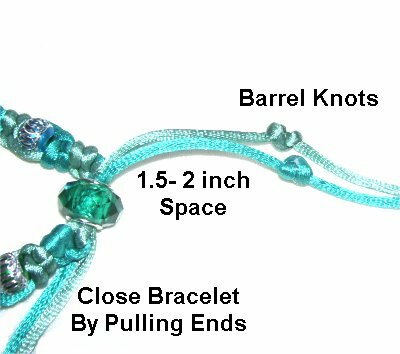 Pull on the ends to close the Beaded Hitch Bracelet. Leave a 1.5 to 2 inch space, and tie a Barrel Knot in each cord. These knots prevent the cords from slipping out of the bead. Apply glue as you tighten the knots. When the glue dries, cut off the excess material. Have any comments about the Beaded Hitch Bracelet? Contact Me.